ViewScape are digital property marketing specialists. We work with estate agents to add virtual tours to their online property adverts; generating additional revenue for agents by offering virtual tours to their clients, more instructions with innovative advertising features, and making their properties stand out from the crowd online. Interactive, navigable virtual tours enable anybody to immerse themselves in a property and explore it as if they were really there, at any time. They’re compatible with all websites (including RightMove & Zoopla etc. and social media), and can be viewed on all devices including desktop, mobile and VR headsets. Tours are packed with features which are designed to draw viewers’ attention to a property’s best features, just like you would during a physical viewing. Whether viewed at home or in-branch, virtual tours enable buyers and tenants to explore ten properties in the time it currently takes to view one in person. Just as an agent would at a viewing, our virtual tours are designed to show the viewer around a property, and highlight its best features. We embed videos, or any other media, to showcase selling points; whilst the ‘doll house’ view shows a truly unique spacial perspective. Virtual tours work on all of the websites, channels and platforms you currently use to advertise your properties, including sites like RightMove, on mobile devices, and in VR. Tours are delivered as both a URL and a direct HTML5 embed code. Add detail to the best features of a property with pop-out ‘information tags’ within the virtual tour. When a tag is clicked, it displays any of over 400 media types, such as text, images, videos and 3D models. This enables us to add videos of high-end appliances, photos of fine details, or PDF marketing brochures. Whether users view virtual tours at home, or guided in your high-street branch, in VR or on screens, they can typically view around ten properties in the time it takes to view one. Save time on wasted viewings by having viewers select their favourite before leaving the office. Virtual tours are compatible with all major virtual reality headsets. This enables you to show buyers or tenants around properties from within your estate agent’s office, alloing them to select their favourites before going on physical viewings. We work closely with estate agents and your flow of property stock; once you tell us an address and agreed time, we manage the entire process from scanning and photographing the property, processing and assembling the virtual tour, editing photos and creating any floor plans required. Get in touch to discuss your first property, and how we could work in partnership to bring virtual tours to your estate agency. Do you cover the whole of the UK? Yes! We create virtual tours for estate agents across the UK from our offices in London, Reading and Bournemouth, and our national network of trusted photographers and 3D scanners. Often with ongoing partnerships we’ll employ a local account manager for you. Do you include photography and floor plans? Yes, we can include photography and floor plans at discounted rates with every virtual tour, completing your estate agency advertising media. That depends on how many virtual tours we create in a given month. The more we create, the less it costs per property. As a guide, a single property in a month typically costs £249-£349 depending on size. More than one property in a month means significant discounts can be achieved. Combining photography, floor plans and virtual tours creates the best value for estate agents, allowing you to get all three from one place at a discounted package rate. We shoot professional interior, exterior and 360° photography according to your requirements. You’ll receive a set of schematic black and white floor plans, plus a full detail, 3D photo-rendered plan available within the tour. Combining with photography and virtual tours is convenient for estate agents, and we complete all three with one visit to the property. Virtual tours can be processed as virtual reality experiences, creating the most immersive experience and most innovative way to advertise real estate. Compatible with all virtual reality goggles which work with your smartphone. 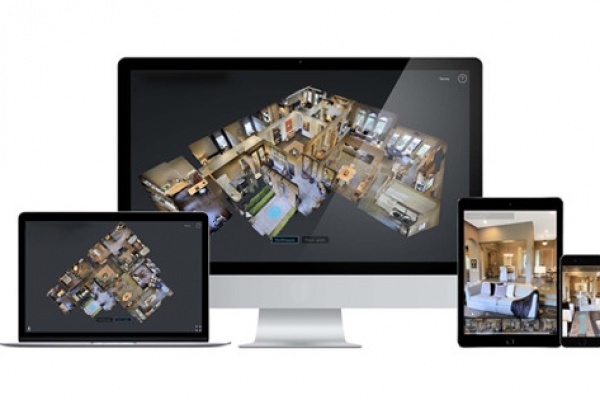 By using state-of-the-art technology that captures a full 360-degree spectrum of any space, a cutting edge stitching software, and reliable tour hosting, you can now seamlessly capture, view and share the interior of any real estate listing. 360 virtual tours give estate agents maximum advantage to showcase a wide variety of homes in a competitive market. 95% of all new property searches begin online. Therefore, it is imperative that your website offers buyers and sellers as much information about the properties as possible. 360 virtual tours are immersive online 3D experiences that allow prospective buyers to view a property in a way that no ordinary two-dimensional photography can do. 360 virtual tours give prospective buyers confidence in what they’re viewing as they’re able to get a feel for the property and see a complete picture. Research carried out by Realtor shows that real estate listings which feature a virtual tour are viewed 40% more than listings with only traditional ‘flat’ photographs. By allowing prospective buyers to virtually view a property before they book a real-life viewing, you’re able to root out less interested buyers and attract more qualified open house attendees. Having a Virtual Tour on your real estate listing is like having a 24/7 open house – without the presence of the agent or home seller to show the property. According to Property Week, Virtual Tours reduce the amount of wasted viewings by 40%. Where can tours be used? What’s great about 360 Virtual Tours for estate agents is that they can be used in a multitude of ways, making sure that you get real value out of your marketing spend. The obvious one is on your website. If you’re digital marketing savvy, you’ll know that adding a 360 Virtual Tour to your website will boost your Google ranking, increase your conversion rate and decrease your bounce rate. Realtor’s research shows that visitors to a website that features a virtual tour stay 3x longer. The next big one is social media. Share it around! Social media channels including Facebook, YouTube, Twitter and LinkedIn give businesses the opportunity to upload video content to drive prospects to their website. If you have a company newsletter – spruce it up by including a link to your 3D Virtual Tours, it’ll up your viewing figures, keep people on your website for longer and increase the likelihood of you completing a sale. Realtor research shows that 75% of the interviewed potential real estate buyers stated that they preferred interactive virtual tours over normal photographs and influenced their purchase decision.